The airport’s selfish plan to capture all the new revenue from revamping Terminal 1 while making others pay to solve related transportation problems is shameful. The Airport Authority has circulated a flawed and misleading draft environmental impact report to redevelop Terminal 1 at San Diego International Airport. The airport wants to push the costs to minimize traffic, transit and air emission impacts onto residents, local businesses, the city of San Diego, the Port of San Diego, SANDAG and others. Unless corrected, this project threatens nearby neighborhoods, leaving them with more traffic, more noise and more air pollution, and little in the way of plans to eliminate or minimize these impacts. The environmental impact report uses outdated facts, understates problems this redevelopment creates and ignores the impacts on residents and businesses in Point Loma, Little Italy and elsewhere. The Airport Authority should go back to the drawing board and get it right. The airport’s impact report uses seven-year-old data to forecast passenger and cargo operations through 2050, instead of using current publicly available information. All the airport’s traffic estimates, projected greenhouse gas emissions and noise levels are wrong because they are based on old data. 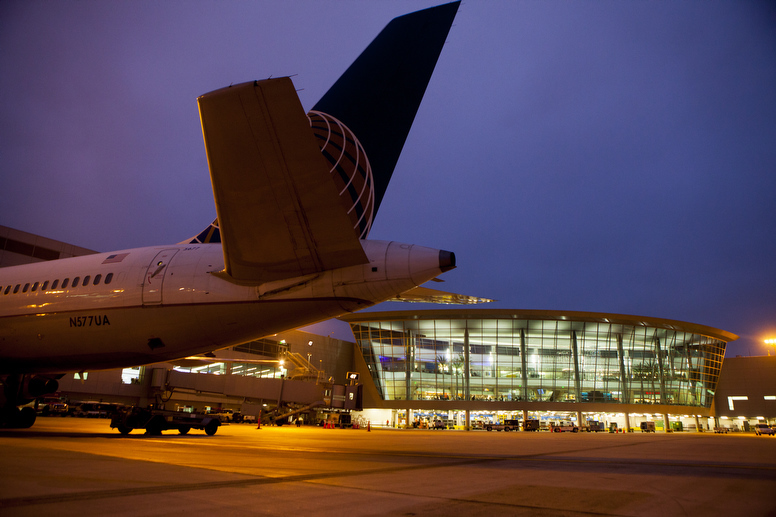 The impact report cites data belied by the airport’s own statistics: In 2017 the airport served more than 22 million passengers, yet the airport’s report assumes it served only 19 million. This year the airport will serve about 24 million passengers — but the report forecasts this volume won’t be reached for another 10 years. The airport plans to put more passenger cars, delivery trucks, taxis and ride-sharing vehicles onto our streets, creating many more traffic snarls. Yet the environmental impact report ignores most of these new traffic problems, especially on Harbor Drive and Rosecrans, Nimitz, Grape, Hawthorn and India streets. Despite its $1 billion price tag, the airport’s redevelopment plan fails to move passengers efficiently, and its analysis fails to address all the problems it will cause outside the airport fence. As usual, the report fails to analyze connecting the trolley with the airport. Instead of taking responsibility and addressing its paltry transit rider numbers with a connection to the trolley, the airport’s redevelopment plan instead simply references a future SANDAG transit project that is unfunded. The airport can and should build a “people mover” that takes passengers to the Washington Street and Middletown trolley stops, with roughly 90 percent of this people mover on the airport’s property. San Francisco has done it, and LAX is doing it now. The Airport Authority often claims that the Federal Aviation Administration won’t allow it to spend money outside the airport perimeter. That is contrary to actual projects approved by the FAA, including a recent project on Sassafras Street outside the airport boundary. More than 10 percent of traffic coming into the airport is from ride-share services, but there is no plan to build a ride-share area that can grow with increased passenger volume. The airport’s transit “solution” in its environmental report is limited to busing people to Old Town, but even that is found to be “not considered fully feasible,” according to the airport. That is an archaic and inadequate response to a project that will generate millions of additional passengers annually, creating billions of dollars in new airport revenue over the next several years. The airport’s selfish plan to capture all the new revenue while making others pay to solve related transportation problems is shameful. The airport’s redevelopment plan does not provide a cumulative traffic forecast for Harbor Drive, but an analysis by a traffic engineering firm for the Port of San Diego shows there would be an increase in traffic of more than 70 percent on Harbor Drive by 2050. The airport’s impact report shows there would be a 22 percent increase in greenhouse gas emissions by 2035. Even these dramatic increases in traffic and air pollution are based on outdated and inaccurate data. Based on current data on the airport’s website – which the airport has chosen to ignore – traffic increases and air pollution will be significantly greater. The airport’s narrowly focused and insufficient analysis covers only Harbor Drive between Grape Street and Terminal 2, meaning traffic and noise impacts in Point Loma and Little Italy were ignored, and no plans are offered to deal with problems in either community. Similarly, the impact report offers no real solutions to reduce greenhouse gases. An unprecedented group of responsible agencies has lined up to challenge the airport’s impact report, including the city of San Diego, the Port, Circulate San Diego, residents in Point Loma and Little Italy, SANDAG, CalTrans, Coastal Commission, State Lands Commission and environmental groups. The Airport Authority must act responsibly, not hide its head in the sand. It needs to recirculate its impact report and do it right. San Diego deserves a world-class airport that will serve our entire region as well as visitors to our amazing city that also addresses and mitigates real impacts to surrounding neighborhoods — not just those on airport property. Lorie Zapf is a members of the San Diego City Council representing District 2. Lorie Zapf is the San Diego City Councilmember representing District 2.